I’m sure you, like me, have experienced those convicting moments where while praying you either say the same thing several times, or your mind wanders and you must reign in your thoughts. There are a multitude of means by which Satan affects our prayer lives, but we must be prepared to combat him. For me, my prayers often seemed stale and shallow. I rarely remembered the issues or people about which or whom I had interceded, and that was convicting. This past fall I purchased Praying the Bible by Don Whitney, professor of Biblical Spirituality at Southern Seminary at a conference and shelved it when I returned home. As I was packing several weeks later for a month-long international trip, I stuffed the book in my carry-on and kept packing. The elusive “quiet time” has been a downfall for many, and the material we use with the intention of guiding us through studying Scripture often ends up supplementing or replacing our Bibles and can be incredibly dangerous, even heretical (I’m looking at you, Jesus Calling). As I began to read Praying the Bible, I immediately understood that this was not a study guide that would help my quiet time but a method of approaching prayer and Scripture reading that would transform my prayer life. I finished the book in one week (it is short!) and began the journey of praying the Bible beginning with Galatians (Whitney presents a model for Psalms). In addition to the method Whitney teaches, my pastor had also recently suggested journaling prayers, a great way to see in timeline view God’s faithful answers to our petitions. Armed with my Bible, journal and a pen, I started this journey of a renewed prayer life and have been forever changed. I urge you not to let your prayer life go stale like I did, and if (when?) you do, return to the Scriptures (Heb. 4:12), pray for forgiveness (1 John 1:9), daily approach the throne of God (Rom. 12:12), and trust him to be near you (Psalm 145:18). 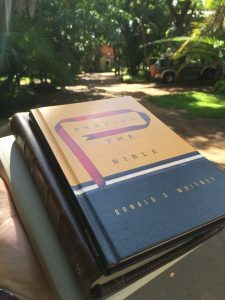 Praying the Bible is a short, inexpensive book that has completely changed my prayer life, and I cannot recommend it enough. Michael Davis serves at the BGCO Conference Centers as the Multimedia Coordinator, is a student at The Southern Baptist Theological Seminary and leads worship at Davis, First. Michael Davis has written 8 posts. REVIEW: ‘Smallfoot’ is fun, but does it have an anti-religion message? What Is Going On With Modern Worship Leaders?